KC is in Atwater shorts and the Kameha jacket by Odeyalo, a Monterey bralette by Aritzia and an Anne Marie Chagnon necklace from Belle et Rebelle. At the beautiful and lush Aquatopia Conservatory, we showcase eco-conscious brands that share a vision for a sustainable future. Luxurious, high performance eco- and cruelty-conscious cosmetics are also featured, in keeping with the theme of sustainability. Those beauty brands include Fitglow, Sappho, Saint, Axiology, Ilia, Hynt, Kjaer Weiss and Gressa Skin. 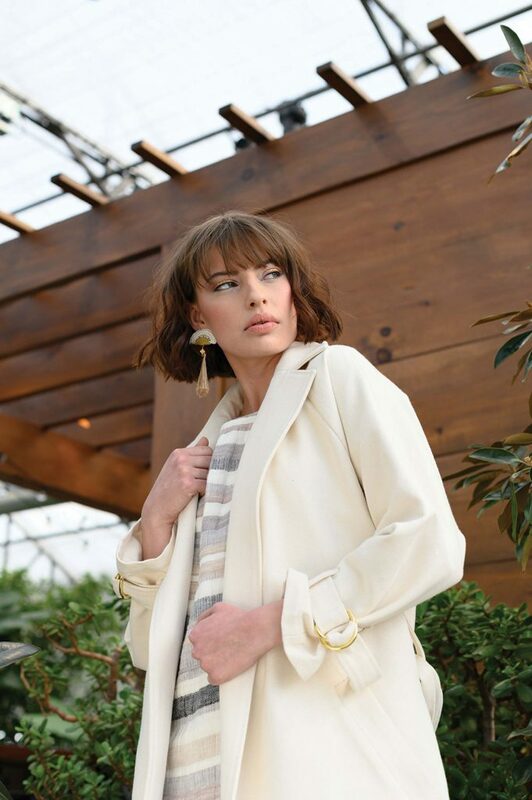 KC is wearing the Palm blouse by Ursa Minor with white pants by Odeyalo, along with Früg earrings. The Anne-Marie Chagnon ring is from Belle et Rebelle. The Maneki dress and coat are by Odeyalo and the This Ilk earrings are from Belle et Rebelle. The grey dress is by Megan Duffield’s Duffield Design, duffielddesign.ca, of Dunrobin, Ontario. The sunglasses are by GoWood, and the earrings are by Bijoux Pepine, bijouxpepine.com. KC’s Kitsune red romper is by Odeyalo, her Sawyer Coral corduroy boots are from L’intervalle, and her Blackburn & Raymond hat and Surond Studio earrings are from Belle et Rebelle. Odeyalo and Ursa Minor items were sourced directly from the designers in Montreal, but the brands are carried by Victoire in Ottawa. Aritzia is in Rideau Centre and Bayshore Shopping Centre.